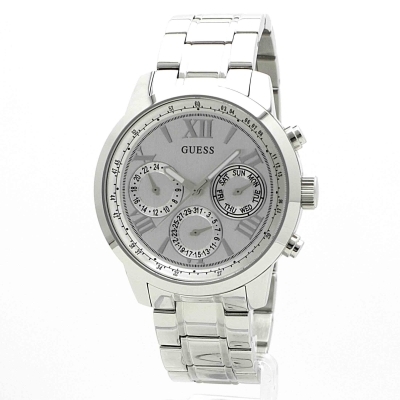 GUESS Ladies watch with a polished silver case, silver chronograph look multifunctional dial and polished silver bracelet. Very elegant watch. Excellent price. Bought this watch for mothers day and it was a success. The design is really simple but elegant and matches everything she wears. Bought this watch for my wife and she really likes. It is bit bigger than what I thought it would be. But still I very nice smart looking watch. It is simple in design but has a presence when worn. A stunning ladies watch at a great price. Easy to read face, with stunning elegance. Perfect for the lady in your life. Looks even better in real life. Had to get a link out which Goldsmith took care of free of charge. Features as desribed. Day and date are easy to read and set. Great choice. Ordered my watch by 11:30 arrived 24hours later. It was perfect. Exactly how it was described. Slightly to bug but after a few links removed it was perfect. I would never purchase a watch any where else. Amazing choice and superb value for money.